We offer fine art prints that feature the western lifestyle, including limited edition and open edition prints, as well as giclee prints, canvas prints and canvas transfers. 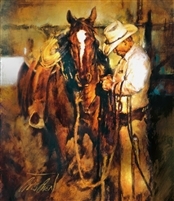 We bring the opportunity to own and incorporate quality western art into everyone's home decor. Feel like you are down on the farm or the ranch with these art prints that star cows, calves, and all types of cattle. Kids do the funniest things and our prints showcase children living the western lifestyle and loving every minute of it. Cowgirls have always been a vital part of the west. 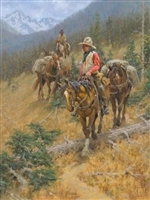 We offer western art prints highlighting the beauty, perseverance and tradition of the cowgirls and ladies of the west. Donkeys, mules and burros are often seen as the work horses of the west, but as our prints depict, these ranch animals are actually quite majestic. Living in the west offers a beautiful array of flowers. These art prints showcase the floral landscapes and alluring flowers that can be found throughout the west. Historical art from many different eras are offered here in print form, as canvas prints, giclee prints, open edition and limited edition prints. Holidays often bring cherished traditions and special moments that are captured in these holiday themed prints. Horses are an important part of the western lifestyle. The prints that we offer showcase our love of all equine and their vital role in the west.